Almost all tea estate resorts in Darjeeling hills center around the old British planters bungalow which have been restored to the past glory creating an old British Raj aura and offering a true glimpse to the past British days while you enjoy luxury amenities . Although Soureene Tea Estate is over 100 years old, it unfortunately does not have the colonial heritage. This was a tea garden which once belonged to a Nepali contractor who had to finally hand over the property to Tiwaris of Kurseong in order to settle large sum of loan he had to repay. Subsequently the tea estate went through changes of ownership and now belongs to Titagarg Wagons Limited, a company which has a business with the Indian Railways. Sourenee has however tried (and quite successfully though) to overcome the lack of British heritage by building a nice 3-storeyed luxury bungalow type resort which combines the old world charm with modern amenities and offering an elegant & upscale stay right amidst the tea gardens with sweeping views of tea bushes on slopes of the hills, Mirik valley, mountain landscapes and even sights of Nepal. Sourenee tea estate is located about 1 hour drive from Bagdogra airport and about 1 hour 20 minutes from NJP railway station. The estate is on the Siliguri - Mirik - Darjeeling route that passes through various tea estates with lush tea bush plantations and all the way to Darjeeling. It's a smooth ride. The entry to the resort is located about 7kms before reaching Mirik, in a place called Sourenee and shortly after the lovely Tingling View Point where you can stop for a while to soak up wonderful views of tea gardens around. There is a small Sourenee Tea Outlet here at the Tingling View Point. The word Sourenee has been derived from a local legend... people say it's a combination of two local Hindi words 'Sau' and 'Rani' which means 100 Queens. Another version of the legend says it's combination of the words 'Sour' (a medicinal tree growing in the area) and 'Rani'. Sourenee tea estate has its altitude varying from 700meters to 1300meters and covers an area of 137 hectares. The estate produces black tea, green tea, black blossoms, silver green, oolong etc. 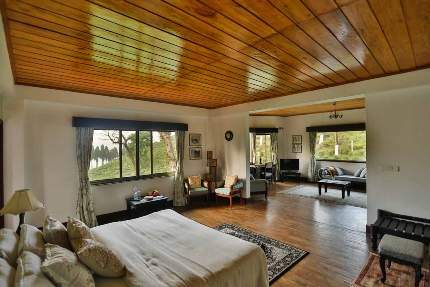 The bungalow is located near the high altitude area of the estate and right in the middle of the tea garden. This 3-storied bungalow style resort was constructed in 2011, however more internal renovations have been done later to make rooms comfortable. Neena Pradhan, the lady who was instrumental behind shaping tourism in Glenburn Tea Estate, had joined the team here and worked closely with the architect of the resort and helped set up tea tourism at Sourene as well. Neena these days finds her passion in cooking. The resort bungalow is created at an elevation... from the tea garden a marbled stairway leads up to the bungalow entrance at the ground floor and its own fenced garden area. The lounge and the dining room are on the ground floor. The doors of the dining room open up to lovely vista of the garden. There is also another central lounge on the first floor with sofa seating and nice views. 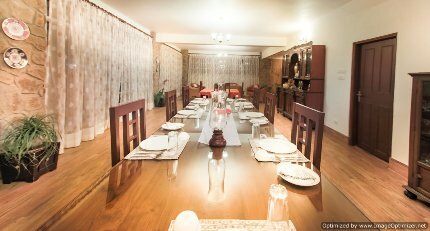 The resort has seven accommodation units of various types and all have been named on mountain peaks or high altitude places like Kabru suite, Sandakphu, Zongry, Tonglu etc. All units are large & spacious and spread across three floors of the resort having elevator access. 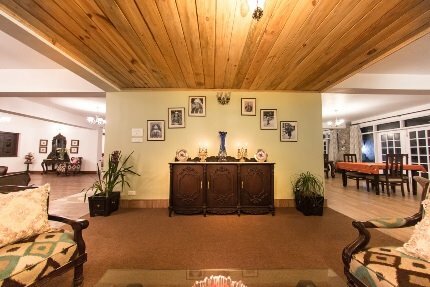 There are 5 double rooms each with an area of 360 square ft, one junior suite (600 square ft) and a family suite with two separate rooms and a sitting area with total floor area of 1,200 square ft. All units have wooden floor paneling and the suites additionally have wooden ceiling panels. Rooms are very elegantly done up with classy furnishing. Rooms have heaters and bed warmers to keep you comfortable during the winter. There is no TV in the rooms (except in suites) and the internet tower is weak as well as intermittent. This however helps in cutting yourself off from your daily routines and enjoy a true tea garden life. Depending on the room, you get wonderful views of tea gardens, Mirik valley, mountains, the tea factory building and even Nepal. The family suite has sweeping 360° panoramic view. The resort has a well equipped gym and a Jacuzzi with wonderful views of the tea gardens around. They also offer spa massages in the resort. There is a set food menu (veggie & non-veg), but you need to order in advance so they can make it ready in time to be served at the dining room. Food prepared is in general very good. You get choices of Indian, Chinese, Nepali and Burmese dishes. In season they also offer bonfire/barbecue dinner in the garden. You can choose to take your morning tea in the room or they can arrange it right in the middle of tea garden. Depending on weather, sometimes they arrange lunch outdoor on the lawn. Wine and beer are available in the resort but the stock may not be always enough. The resort offers tour packages like 1night, 2nights ... up to 7nights, they can also customize it for you. Being an upscale luxury stay, the tour package cost is quite higher compared to many tea garden resorts in Darjeeling hills. However transfers from and to Bagdogra airport/NJP station is included in all packages as well as mineral water, multi cuisine meals, laundry services etc. 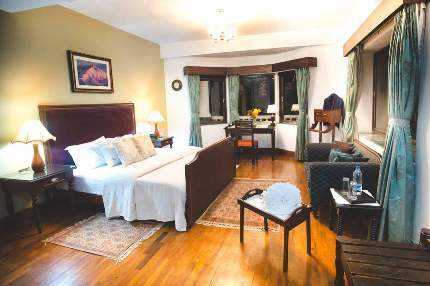 A 1night package would typically include activities such as pickup, stopover for tea & sandwiches along the way, trek through tea garden bushes (there are seven wonderful trekking trails in the estate), reach the stream below for high tea, cultural program by local dancers in the evening with bonfire and barbecue dinner (this is seasonal though), visit a view point to watch Kanchenjunga snow peak, visit to the factory to see tea processing and even tea tasting, drop to airport/station etc. Additional activities are included in the packages with more number of night stays including day trip to Darjeeling covering Himalayan Mountaineering Institute, the high altitude Zoo, toy train joy ride etc (note reaching Darjeeling requires about 2.5 hours one way and may not be suitable for those prone to road sickness especially kids), day trip to Mirik & Jorpokhri, village tour etc. Over all a great tea resort, but quite pricey compared to many others in Darjeeling hills. 756, Anandapur, E.M. Bypass (behind Rubi Hospital), Kolkata-700107.